The Hitman's Bodyguard is a film that is simultaneously a parody, a love story, a comedy and a gore fest. Unfortunately, director Patrick Hughes does a half-hearted job with each of these categories. As a result, the movie seems to alternate between tones with the confusing indecisiveness of a toddler picking out sweets at a candy shop - in one moment you are enjoying some comic banter that has been blown apart by f-bombs, and in the next the screen is splattered with gratuitous gore. After the success of Deadpool, you might have thought Ryan Reynolds would have had this one in the bag. 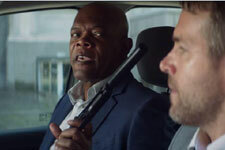 The Hitman's Bodyguard is another Deadpool, only minus the costumes and plus Samuel L Jackson (certainly not a bad trade-off). But even all of Reynolds' charms can't save this movie from its poorly-directed and dull action sequences and chases, and its utterly simplistic plot (in which the way to the end is paved with plot-holes). 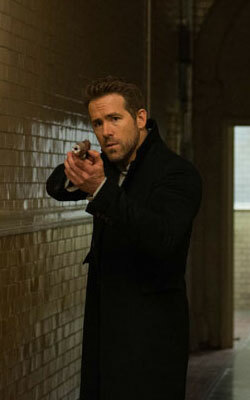 Michael Bryce (Ryan Reynolds) is the proprietor of a business that offers protection services to wealthy characters (often of questionable morality). After losing a client, his business loses its triple-A rating and the losses cascade from there. Bryce ends up trading in his Jaguar for a car that is far less conspicuous and far more smelly, and offering his top-notch services to cocaine-addicts. Meanwhile, the corrupt and bloodthirsty ruler of Belarus and perpetrator of numerous war-crimes, Vladislav Dukhovich (Gary Oldman), is on trial for his crimes against humanity at the International Criminal Court. In a desperate bid to procure at least one witness who can supply hard evidence against the dictator, Interpol ropes in professional hitman Darius Kincaid (Samuel L Jackson) and strikes a deal with him - his testimony in exchange for the freedom of his wife Sonia (Salma Hayek). Amelia Roussel (Elodie Yung), a young Interpol agent, is assigned to ensure Kincaid's commute goes without a hitch. When she and her squad of agents with Kincaid in tow are ambushed, she and Kincaid barely make it out alive and into a safe house. In order to circumvent the plans of the moles inside Interpol, Roussel decides to avail herself of the services of Bryce (her ex) in getting Kincaid to court in one piece. When the two professionals are thrown together, with Bryce's methodical and meticulous approach hitting a roadblock against Kincaid's preferred style of rushing into the fray head-first, plenty of bickering and yelling ensues, with Kincaid saying Samuel L Jackson's favourite 12-letter buzzword half a hundred times, to fewer and fewer laughs. That, along with some violence and a couple of romantic sub-plots, pretty much comprises the rest of the movie. The cinematography is well done - the action sequences are shot in a way that is not confusing, and keep you involved even when the choreography is somewhat lacking. The flashback scene about Kincaid's first meeting with his wife is particularly good in its filming and direction - the fighting and blood are used as the punchline of a joke, with Kincaid's lovestruck expressions and romantic background score highlighting the comedic intent behind it. The musical score is reminiscent of that of the Mission Impossible or James Bond films, especially during the starting credits - fitting, since the beginning promises to parody that genre, though it devolves from there. The cast is the movie's saving grace - the rapport between the leads and their scenes together, where they argue like an old married couple (though with far more firearms), is what gives this film its single A, one-time watch rating. Reynolds does not disappoint - his patented and profanity-laden mix of dry humour, sarcasm, deadpan expression and occasional enraged outbursts do him credit here. Jackson plays the perfect counter to Reynolds' character's calm, logical, discreet and rather controlling ways - he is like a battering ram from whom both bullets and angry bodyguards seem to bounce off without leaving a dent. The dialog between the two is well-written, and it is unfortunate that it is continually interrupted by crashing cars and gunshots. The progress of their relationship, as they insult each other, swap stories of their pasts, get shot and go through windshields, is enjoyable to watch. The supporting cast give laudable performances, too. Yung and Hayek are both satisfactory as the badass ladies with whom the leads are smitten, and Oldman is rather terrifying in his short part as the quietly maniacal, merciless ruler. If you are a diehard fan of both the lead actors and desperately want to see them together, The Hitman's Bodyguard is the movie for you. Otherwise, watching Reynolds and Jackson in separate movies is the better alternative - some relationships just don't work out when the circumstances are wrong, even if the pair are a perfect match. Be the first to comment on The Hitman's Bodyguard! Just use the simple form below. fullhyd.com has 700,000+ monthly visits. Tell Hyderabad what you feel about The Hitman's Bodyguard!